Complete strangers approached the 7-foot-5, 340-pound Bhullar and asked to take a picture with the freshman because they had never seen anyone of his size before. "It's pretty much everywhere we go,"Mullings said. "Even students on campus too. They just can't get past how big he is." Everyone from little kids in airport terminals, to waitresses at restaurants, to students in his sociology class flock to Bhullar to take pictures with him, but he has proven he's more than just a novelty act in his first season at New Mexico State. Bhullar averaged 15 points, 12.5 rebounds and 4 blocked shots in the semifinals and finals of the WAC tournament last week, leading his team to a second straight title and earning the Aggies an opening-round NCAA tournament matchup with fourth-seeded Saint Louis on Thursday. "He's not just big -- he's good and big," Saint Louis coach Jim Crews said. "That's a real compliment to him because we saw some tape earlier in the year and how he has progressed has been really enjoyable to watch from a coaching standpoint. That's pretty neat." When Bhullar was gasping for air after a few possessions during offseason pick-up games and lagging well behind his teammates during early-summer conditioning, it seemed unlikely he would make more than sporadic impact as a freshman. Instead he shed 30 to 40 pounds during the summer and fall by cutting candy and junk food from his diet and ramping up his conditioning work before and after practices. Getting into better shape has enabled him to play more minutes without tiring so quickly, a vital development for the Aggies after starting center Tshilidzi Nephawe went down with a season-ending injury in December. Whereas Bhullar averaged only 13.6 minutes per game in November, he played 28 or more in New Mexico State's final 13 games of the season, helping the Aggies win 11 of those with his ability as a low-post scorer, rebounder and rim protector. "He's a very cerebral player, he's an excellent passer and he has very good hands," New Mexico State coach Marvin Menzies said. "He's still a freshman and he's still learning and he's going to make mistakes like most players, but his maturity for his age is very advanced." Bhullar's size and potential and his Indian heritage give him a chance to be a basketball trailblazer. Though Bhullar grew up in Toronto, both his 6-foot-4 father and 5-foot-10 mother were born in India. As a result, Bhullar and 7-foot-3 younger brother Tanveer, a promising high school prospect, both have the chance to be the first prominent basketball players of Indian descent. New Mexico State opted not to make Bhullar available for an interview on Wednesday citing a policy of not having freshmen talk to the media, but his teammates and coaches say he has embraced the chance to make history. 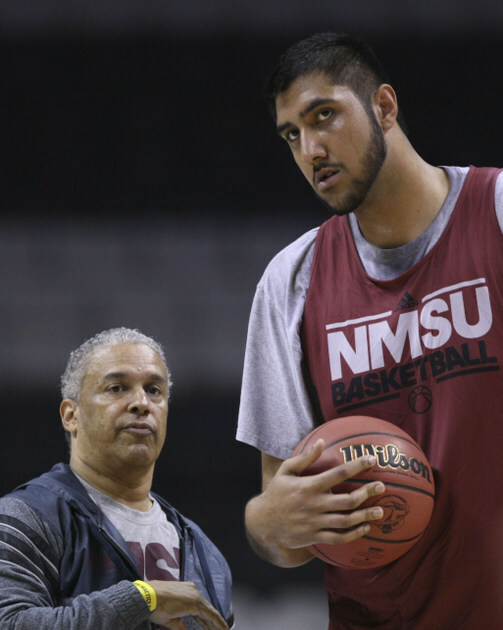 "I don't think it's a burden for him at all," Bhullar's former AAU coach Mike George said. "I think he views it as a great opportunity. It's always awesome to be the first of anything in the history book, and he's definitely eager for that challenge." 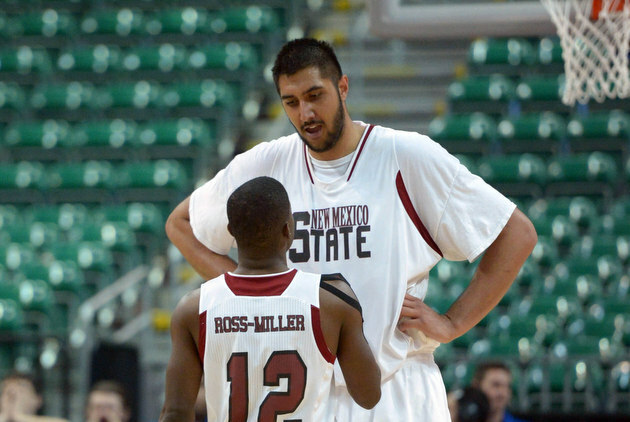 Already 6-foot-3 by the time he started sixth grade, Bhullar has always been big for his age. George said Bhullar "didn't look like he could tie his shoes and chew gum at the same time" when they first met, but gradually the young big man gained more coordination and developed into a major college prospect. On April 28, 2011, Bhullar committed to Xavier, a decision he felt comfortable with at the time because of his relationship with the coaching staff and the way 7-footer Kenny Frease had developed in the Musketeers program. Bhullar eventually backed out of the commitment when he didn't qualify academically at Xavier and he feared he'd have to pay full tuition his freshman year to attend the school. It was already mid-August 2011 by the time Bhullar got in touch with New Mexico State assistant Paul Weir, a Toronto native who had recruited five other Canadian-born players on the Aggies roster. Weir had previously recruited Bhullar a bit and was very familiar with his game, so it was easy for him to sell Menzies on the idea of taking the 7-foot-5 big man even though Bhullar had to sit out the 2011-12 season as a partial qualifier. "It's a very close-knit family, and they didn't want him going far from home at first," Weir said. "New Mexico to them was Siberia. But I knew his AAU coach really well and his assistant really well, so the family was comfortable with me. ... He came to New Mexico State without ever even visiting the campus." The gamble by both Bhullar and New Mexico State looks shrewd now that he's beginning to tap into his potential. Saint Louis is concerned enough about him that much of the Billikens' game preparation has centered on defending him in the low post and keeping him off the offensive glass. The one advantage Saint Louis does have is that center Rob Loe can pull an opposing big man away from the basket because of his range out to the 3-point arc. Still, short of having one of their team managers don a sumo suit and hold up a broom stick, there's no way for Loe to recreate what it will be like to face Bhullar. "I don't think you can really simulate playing someone of his size," Loe said. "You just have to work harder, use your feet a little bit better. He's bigger but he's probably a little bit slower. You have to use that to your advantage." Most opponents have double teamed Bhullar when he touches the ball in the post, but it shouldn't bother him if Saint Louis does it. Whether it's in the paint, at a restaurant or in the airport, Bhullar is used to drawing a crowd. "He loves it," George said. "I don't think he ever found the attention hard. He's really good with little kids. He embraces it and I think he's thankful for it." • What are the odds of a perfect NCAA tourney bracket?